Moving houses may be stressful, but moving an office is usually downright petrifying. Not only must you figure out how to transport your furniture, electronics and office supplies without taking them out of service for too long, but you must also pack up hundreds (if not thousands) of files and critical documents that can't afford to get misplaced along the way. Here are 16 tried and true office moving strategies as suggested by professional movers and office managers. Try them out to relieve the anxiety of your office moving so that you can get back to work as soon as possible. Familiarize yourself with your new office. This is extremely important because it will enable you to start unpacking as soon as you arrive in your new space. Getting familiar with your new give you a glimpse as to whether you'll have sufficient space for all your documents and furniture, or whether you'll need to reconfigure your work space and file storage. Make sure to measure all of the areas, look around for working outlets (and non-working outlets!) and to visualize how each room and hallway will look when it's filled with office furniture and file cabinets. Interview multiple office movers. If you're moving a home office, you'll obviously be able to rely on the moving company that is moving your home. But if you're moving a company office, you'll want to get moving quotes from companies that have experience with industrial moves. Choose a moving company that makes you feel comfortable and that seems to be timely, reliable and trustworthy. Get recommendations from other business owners or office managers, and remember that while price is important, reliability should be your top concern when choosing a moving company for your office relocation. Check with your building manager for use of the service elevator. This suggestion applies both in your current building and in your new building. Before confirming the date and time of move with your mover, you'll want to make sure that you'll have access to the service elevator when you need it. Create a time-bound work plan. If you're moving a large office you can expect the entire process to take at least 3-6 months until everything finds its proper place. To streamline the process try to make a very specific plan as to how you'll unpack and when. Try to alternate unpacking activities so that you don't get bored or frustrated. If you unpack the conference room one day, the A-F file cabinets the next day and your office the next, you may also have a better ability to remember where things go as files won't blur together as they would if you unpacked all your files successively. Delegate. Assuming you're moving a professional space and not a home office, you'll need to have a team that participates in the task. While, theoretically, you may be able to pack and unpack most of the office yourself, you'll surely want your teammates to help you, so that you don't spend the next 6 months answering questions about where things are located. Encourage each team member to pack and unpack his or her own office space, so that everything will have a comfortable and proper place. Keep lists. There are several lists that can be helpful when beginning your office move. The most obvious list is the one that inventories all of your office equipment and furniture. A more important list, however, is the one that catalogs all of your important documents. You should also keep a master list of jobs that each employee will be performing for the move so that you'll know who to ask if you have a question. A fourth list that you'll need is one describing where things will go in your new office. This may be considered part of your work plan, but it's an important list to generate in advance. Keep your teammates informed. Keeping your team updated on the progress of the move is critical to avoid tension and frustration during the process. Scan your documents. If you haven't switched to a paperless office yet, now may be the time. Having someone scan all your documents and paying for the required storage and software isn't cheap – but neither is paying for the transport, packing and unpacking of years of files. You may spend a little more to digitize your documents, but chances are great that you'll be happy in the end. Reconsider old electronics. Too busy during the move to consider upgrading your electronics? If you're planning an upgrade in the near future, doing it before the move can be the best time to do it – if you've thought about it in advance. Not only will you avoid lost work hours while old computers are in transit (or in boxes), but you'll avoid the expense of moving nearly defunct machinery. Supervise the packing of electronics carefully. If even a single wire is misplaced during the move you may find yourself without a functional phone or computer. To avoid this catastrophe make sure that you watch the movers pack your electronics, and see that they are doing it in an organized, professional way. Order new stationery. Many people forget that they need to update their letterhead when moving offices. Consider this your reminder... and make sure to have it delivered to your new place so that you won't have to pay to move it there. Update service providers about change of address. Make sure to tell your water delivery company, corporate credit card provider and other service providers about your change of address so that you'll continue receiving services in your new place. 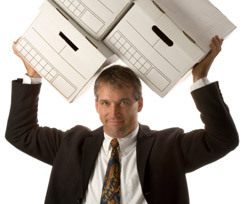 The best approach to an office move is to keep an organized, focused and level head so that you can deal appropriately with any unexpected events that may arise. Pay attention to the process so that you'll be able to unpack quickly and calmly and become the new office hero.